Alex Scrivener is policy manager at Global Justice Now. The idea of a trade deal with Trump scares people. And quite rightly too. After all, the US negotiators’ hit-list includes getting more pus into our milk and more hormones into our meat. And US officials have been clear – they very much want access to the NHS for US multinationals – which Theresa May has refused to rule out. This is why TTIP, the now dead EU-US deal, angered so many in the UK and across Europe. So it isn’t surprising that efforts by the international trade secretary Liam Fox to do a similar bilateral deal with Trump is attracting controversy. But what about Canada? Last month, the UK ratified CETA, the EU-Canada trade agreement dubbed ‘TTIP’s little sibling’. 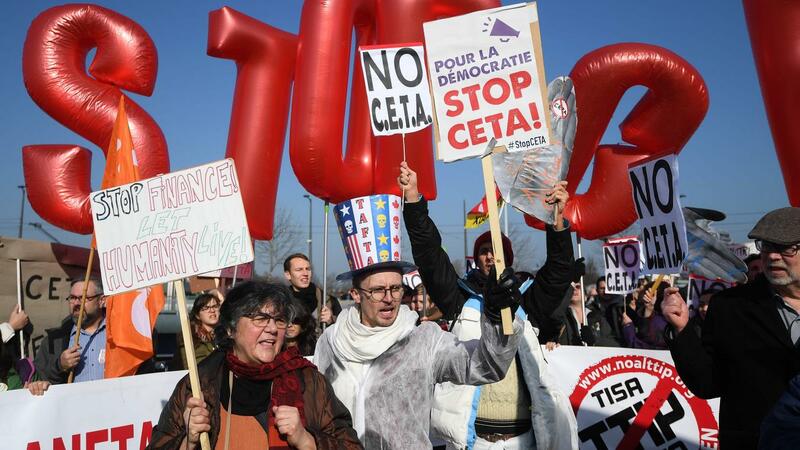 Compared to the controversy around TTIP, there was scant media attention paid to CETA. It seems that while some journalists understand why we might be wary of doing a deal with Trump, fewer thought that a deal with Canada was as newsworthy. After all, surely, we have nothing to fear from that nice shiny Mr Trudeau, right? First of all, CETA is not ‘just’ a trade deal. In fact, getting rid of tariffs and quotas is not the main point of CETA at all. Indeed, if this deal were really about really just about swapping tariff-free maple syrup for Cheddar cheese, there would be little controversy. But it is not. It is about empowering corporations, undermining sensible regulations and locking in privatization. Perhaps most dangerous of all are the so-called ‘standstill’ and ‘ratchet’ clauses in the agreement. Put simply, these clauses bind both sides to keep levels of market liberalization at least where they were at the time of agreement and lock in future privatization in any given sector. For public services like the NHS, the consequences of this are not difficult to imagine. Future governments will be prevented from reversing privatization in the NHS. Similarly, any move to remunicipalize energy or renationalize the railways could be kiboshed by CETA. So whether it’s Jeremy Corbyn, Jeremy Hunt or even Jeremy Kyle in Downing Street, the UK government will have its hands tied on the levels of privatization of public services. And then there are the ‘corporate courts’. This is what gives CETA its teeth. These courts allow corporations to sue governments for any government action that violates their ‘legitimate expectations’. This has led to cases like the one in which Veolia tried to sue Egypt over raising the minimum wage for workers in Alexandria, and Vattenfall forcing Germany to back down over demands that its coal-fired power station comply with stricter pollution standards. Fears that CETA would mean more cases like these forced the negotiators to rush back to the drawing board over the Investor State Dispute Settlement (ISDS) clause in the original draft of the deal. But instead of taking ISDS out of the deal, a reformed version was hurriedly inserted instead. The Investor Court System (or ‘ISDS-lite’ as some have called it) is a modest improvement over the ‘classic’ version of corporate courts. With ISDS, there was little or no transparency and cases were decided by an ad-hoc panel of corporate lawyers who, being paid by the hour, had a vested interest in encouraging more cases by ruling in favour of corporations. The new system does go some way to changing that. There will be a panel of judges appointed to fixed terms, with more transparency and an appeal mechanism. (This system may be expanded beyond CETA to become a permanent Multilateral Investment Court). But at its core it is the same thing. A special court for corporations that will dissuade governments from even thinking about passing regulation that might lead to a lawsuit. Even if doing so is overwhelmingly in the public interest. CETA is also one of the few trade agreements that operate on a so-called ‘negative list’ principle. This means that instead of proactively including sectors that are included in the deal, the sides have to state which sectors are not included. This might not seem like a huge difference but it could have big repercussions in the future – for sectors and industries that have not yet been invented. For example, if we had signed up to a trade deal like this in the 1980s, much of the modern tech industry and online economy would now be automatically included. This is all worrying. But it gets worse. A common assumption about CETA is that the damage caused by a deal with Canada will be limited compared to any similar deal with the US. But that assumption may be wrong: many US corporations have a substantial enough presence in Canada that CETA could become a back door for them to use ‘corporate courts’ to sue the UK. Indeed, such ‘treaty shopping’ happens all the time. For example, the Russian oil firm Yukos used its registration in the Isle of Man to make use of ISDS provisions. This trade deal will be bad for Canada too. Given that UK companies are huge users of ISDS – a 2015 report found UK companies were the source of 8 per cent of global cases – Canada may have even more to fear than the UK. Other firms could follow Yukos’s example and use their presences in UK tax havens to exploit ISDS provisions. Canada has been on the wrong side of some atrocious ISDS cases. For example, when the Quebec government decided to declare a moratorium on fracking, Lone Pine Resources took Canada to arbitration. And Brexit isn’t likely to stop the threats this deal poses either. Thanks to some last minute objections from Italy over protections for products like Parmigiano-Reggiano cheese, it looks unlikely that CETA will be fully ratified before Brexit. This means the UK won’t be subject to the 20 year ‘sunset’ clause that would have locked us into CETA for 20 years even if we wanted to leave, and it means that the UK will have to sign a separate UK-Canada deal. But, unlike some other governments that look likely to use Brexit to renegotiate trade relations with the UK, the Canadian government has made it very clear that it would be happy to roll over a CETA-style deal for the UK very quickly – and even come to a deal that goes even further. It isn’t too late to stop this. But it is going to be hard. The UK has already ratified CETA. Although there is currently no obligation for MPs to get a vote on trade deals, Fox did allow a vote and debate on the deal with Canada – to head off criticism of the lack of democracy over trade deals in the UK (Parliament backed it overwhelmingly, with Labour abstaining despite leader Jeremy Corbyn’s stated opposition). But this swindle means that in future, the trade secretary remains able to sign deals with whomever he pleases – using the Royal Prerogative (the historical powers of the monarchy) with next-to-no parliamentary oversight. This gives the government remarkable powers unparalleled in most EU countries. To stop a future Canada deal, the first thing to do is the ensure the Trade Bill currently in the House of Lords is amended to give Parliament proper scrutiny over trade deals and, crucially, the power to vote them down. Without this sort of change, whether MPs get a say on a future deal with Canada, the US or any other country will be completely down to his whim and that of the government. Meanwhile, we need to convince MPs that our trade deals should be just that – deals about trade, not mechanisms for the corporate undermining of the environment, workers’ rights and public services like the NHS.